DAVID-Laserscanner is a freeware software application for 3d laser range scanning. All you need to build a 3d scanner is a PC, a camera (e.g. a webcam), a background corner and a laser that projects a line onto the object you want to scan. So everyone can use it to scan objects without high costs; this is the big advantage over commercial solutions which are rather expensive. The concept has been developed by the computer scientists Dr. Simon Winkelbach, Sven Molkenstruck and Prof. F. M. Wahl at the Institute for Robotics and Process Control, Technical University of Braunschweig, Germany and was published as a paper at the German Association for Pattern Recognition. The object you want to scan has to be put in front of a known background geometry (e.g. into the corner of a room or in front of two planes with an exact angle of 90-). The camera of course has to be pointed towards the object. The special thing about this solution is that you freely hold the laser in your hand, "brushing" the laser line over the object. Meanwhile the computer automatically calculates 3D coordinates of the scanned object surface. See our gallery to get an impression of the software. To obtain a complete 360 degree model of your 3d object, we have developed DAVID-Shapefusion that automatically "puzzles" together the laser scans made from different sides. · By moving a simple slider you can choose which surface segments will be removed and which will be retained. Also you can delete surface parts easily with your mouse. A preview of the result is shown in a 3D window. · A precise alignment of your scans is very easy. Just choose one of six different registration modes and a few seconds and mouse clicks later, you get the aligned result. · You can fuse/merge the aligned scans with a single mouse click. The result is a connected regular triangle mesh. Our fusion method is more than just an ordinary mesh stitching, since it calculates the average of overlapping surface parts and reduces noise and outliers. · In all alignment and fusion steps, textures are processed along with the 3d data. The result is a fused triangle mesh with a fused texture. · You can define the mesh resolution and smoothness value to optimize the fusion result for your intended application. · Choose between the OBJ, PLY, and STL file format to save your fusion result or your aligned and filtered 3d scans. 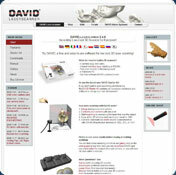 You cannot download any crack or serial number for DAVID-Laserscanner on this page. Every software that you are able to download on our site is legal. There is no crack, serial number, hack or activation key for DAVID-Laserscanner present here. Our collection also doesn't contain any keygens, because keygen programs are being used in illegal ways which we do not support. All software that you can find here is freely downloadable and legal. DAVID-Laserscanner installation package is prepared to be downloaded from our fast download servers. It is checked for possible viruses and is proven to be 100% clean and safe. Various leading antiviruses have been used to test DAVID-Laserscanner, if it contains any viruses. No infections have been found and downloading DAVID-Laserscanner is completelly problem free because of that reason. Our experts on malware detection tested DAVID-Laserscanner with various spyware and malware detection programs, including fyxm.net custom malware and spyware detection, and absolutelly no malware or spyware was found in DAVID-Laserscanner. All software that you can find on our servers, including DAVID-Laserscanner, is either freeware, shareware or open-source, some of the software packages are demo, trial or patch versions and if possible (public domain licence), we also host official full versions of software. Because we want to be one of the fastest download sites on the web, we host all the software including DAVID-Laserscanner on our servers. You cannot find here any torrents or download links that would lead you to dangerous sites.